Autumn is the best time of year to visit an arboretum. By the time the school holidays are upon us, the trees will have exploded into an array of vibrant colours. Children love playing in the woods, and younger children and toddlers will be delighted running through the fallen leaves and finding all sorts of exciting animals lurking in their midst. The Dorset coast takes on a moody brilliance when the summer crowds leave its beaches. The South West coastal path has some of the finest cliff top walks in the world. These are best with a brisk breeze and a heaving sea, as well as the prospect of a cosy pub lunch at the end of it (good motivation for children who only have little legs!). From Hengistbury Head in the east to Lyme Regis in the west, Dorset has a wide selection of beautiful beaches and coves. Over the half term, there’s plenty for kids at the spooky Corfe Castle on the Isle of Purbeck near Poole and if you’re willing to drive an hour or so north into Somerset, Wookey Hole has an extensive cave network and its annual Halloween event. For most of us, by October the weather is too cold and wet for a normal camping holiday with the kids. Factor in that it will be getting dark from around 5.30pm and children will need to be entertained for long hours in the dark under wet canvas, and family camping in October seems best left to the brave (or foolhardy!) few. Glamping is a great alternative. Premium tents and lodges have a range of luxuries – from heating to jacuzzis. In October, glamping offers the outdoorsiness of camping without the dirt, glumness and overall discomfort of pitching a six man tent in a windy and wet field. An alternative to the traditional conker collecting which has long been a feature of British children’s October half terms. 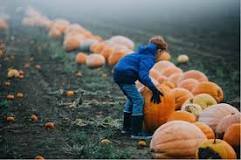 If you’re in London over half term, there are a number of farms near to London offering pumpkin picking days for families as well as many farms dotted around the rest of the country. This is an amazing way to get your kids into the Halloween spirit! Remember to take your wellies – you’re likely to get muddy!